Hi everyone! Hopefully you're all busy getting back into the swing of things after the holidays! Trimming waistlines, organizing closets, back to school, creating traffic in the morning again (blast!). Montreal is back to business. 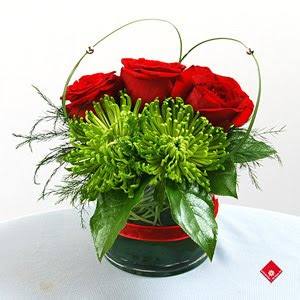 At The Flower Pot, we're busy preparing for Valentine's Day already with three weeks to the big day. Taking all our busy schedules to heart, here's a mixed-bag of news bytes. -Our new and improved wedding sections are up on our website! If you are getting married in summer 2014, check out our new products here and here. -Pantone's 2014 colour of the year is Radiant Orchid. We'll be seeing a lot of purple this year. If you want to be at the forefront of the trend, ask us how you can incorporate the color into any flower arrangement. Don't forget to get in the groove for Valentine's Day! It's time to think about ordering some roses for your honey. Visit our Valentine's Day section for ideas and inspiration here.